This week has been a very busy week. On Monday I got to design flowers for a photo shoot. It was wonderful to have such incredible blossoms back in the shop, and it fed my flower addiction for the week. The shoot was actually in Richmond, so I make a 3 hour trip to work on this project. We got up at 4am to get the flowers loaded and ready, we were in Richmond by 8am. Here I got to meet and work with the very talented and lively event planners of Ashley Baber Weddings. Ashley is the founder of the company and she handles weddings in Atlanta GA. Yes that is right Georgia. Amanda handles the Virginia market and they are a wonderful team. You should deffinately check out their site and blog. One of my absolute favorite weddings of the year was one of their events. The photographer was Julie Renee Photography, I was so impressed with Julie and I can not wait to see the images. 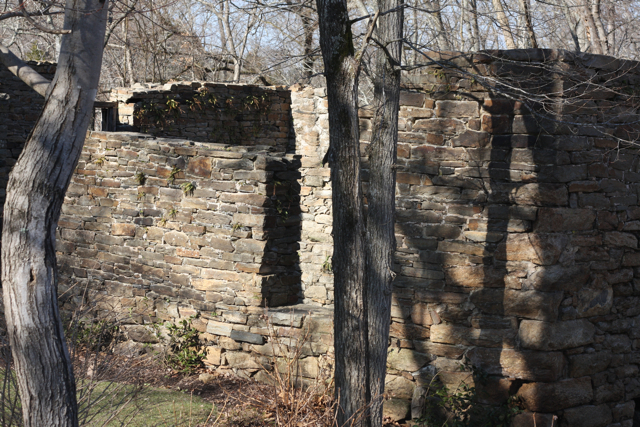 The shoot took place in the stone foundation of a mill. The Mill at Fine Creek, is a remarkable wedding venue and I was in awe with the beauty of this site. Inside and out this venue is a show stopper. Above: left to right is Amanda, Ashley, Diana, Julie and Me, of Holly Heider Chapple Flowers. I love this little cottage on the property. I assume the bride can get ready in this space, if she can tear herself away from the main house. The property is set in the woods. 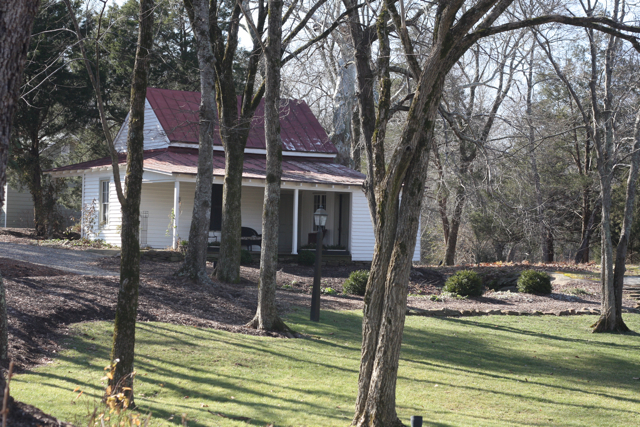 The back decks boast views of the stone mill and and incredible creek and waterfall. Here we all are hard at work. I can't show you the pictures of our table design. That part is a secret for now, but here is picture of an extra bouquet and centerpiece I brought along just in case we needed them. I love this bouquet that I whipped out just before we headed to Richmond. 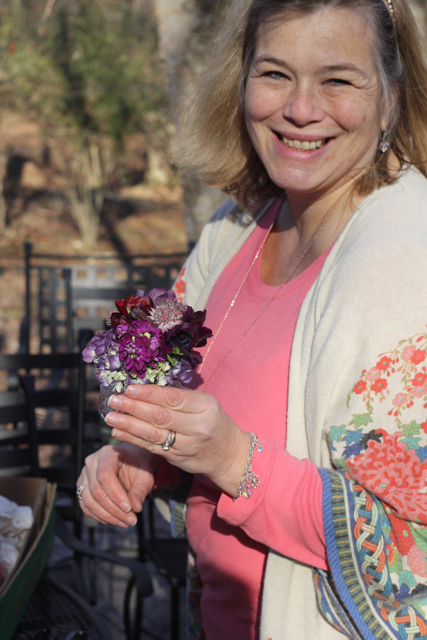 I wanted to use these sweet little flowers that designer Jessie created for me. Jessie brought in a beautiful scarf that she had made with an enormous flower knitted on to the scarf. One second after seeing the scarf, I was requesting flowers knitted in miniature for bouquets and boutonnieres. I am really proud of myself for thinking of this, and even prouder of Jessie for being able to pull it off. I would like to thank the Model Connection for helping us find Diana, our model for the shoot. Thanks also to the Mango Salon for handling hair and makeup.This was an incredibly productive day, I can not wait to see our final results. As I have said before I am head over heels for photos shoots. 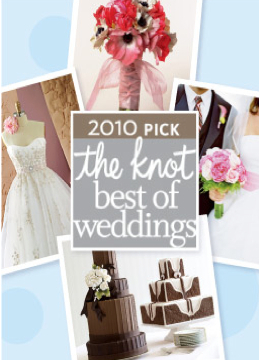 A few other great things to report, we have been recognized as a 2010 Best of Wedding Vendor for the Knot. Let the applause begin!!!! We also earned our Brides Choice award from Wedding Wire this week. I think we are having a really great week. Congratulations! We are excited to announce that Holly Heider Chapple Flowers LTd. has been chosen to receive the Bride’s Choice Awards™ 2010. This award recognizes the top 5 percent of local wedding professionals from the WeddingWire Network who demonstrate excellence in quality, service and professionalism. We also have some other exciting things to report, but it is time to get kids to preschool and I have a full day of floral consultations.